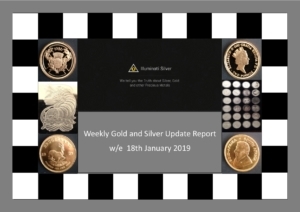 Today is Saturday 19th January 2019 and we are providing our gold and silver weekly update for the week ending 18th January. Gold fell $6 last week from $1287 to $1281 having hit a high of $1,295 and a low of $1,280. In sterling terms gold finished the week at £995 that’s down £7 and in Euros it closed at 1,127 Euros that’s up 5 Euros on the week. Silver fell 25 cents from $15.60 to $15.35 having hit a high of $15.69 and a low of $15.33. In sterling terms, it closed at £11.92 that’s down 23 pence and in Euros it closed at 13.51 euros that’s down 0.09 euros. The Dow Jones closed on Friday at 24,706 up 336 points on the day and up 711 points on the week, and the NASDAQ closed at 7,157 up 72 points on the day and up 186 points on the week and the S&P 500 closed at 2,670 up 34 points on the day and up 74 points on the week. The dollar index stands at 96.33 that’s up 0.66 on the week. Gold prices opened higher last week and seesawed a little but remaining in positive territory attempting to test that $1300 until Friday which saw a $10 decline in price. The main reason for this was the rise in the US dollar following a stronger than expected US Industrial production report for December with the index up 0.3%. Just to clarify the Industrial Production Index is an economic indicator that measures real output for all facilities located in the US manufacturing, Mining, electric and gas utilities (not including US territories). Also, muted Friday, were positive comments coming from the parties involved in the China trade talks with the Vice Premier due to visit Washington at the end of the month. From a technical analysis point of view, any fall below the $1282 level which is the 20-day moving average would test the 200 day moving average at $1248. To the non-techno’s basically $1250 represent quite a strong a floor. Silver markets attempted to enter into positive territory on Tuesday but frankly gradually and slowly fell away until like gold on Friday with the good economic news fell some 20 cents. Most analysts are in agreement that $15 provides a reasonably strong floor and the concern about a falling price should only be exercised should this $15 level be breached to the downside. Most traders we have spoken to are pretty bullish silver at these levels and are buying on dips. We suspect prices will fall a little lower early next week but once again expect prices to be more or less rangebound between $15 and $16 for a little while yet. And on Friday Durable goods orders for December and New Home Sales for December. So, a little light on the economic announcement front. As mentioned last week, the COT Report is still unavailable due to the Government Shut down. So, in conclusion we see yet another week of consolidation, with the Trump Whitehouse in political battle with Speaker Pelosi and the Democrats and the anguish of the continuing pain suffered by those because of the Shut Down. That said there is some positive political news occurring especially in relation to China and a second summit meeting between President Trump and North Korean Leader Kim Jong-un currently scheduled to take place before the end of February. We hate to repeat ourselves but once again its all about the dollar and of course any positive economic news will likely continue to push stock markets up and gold and silver prices down but as mentioned earlier we do not foresee any significant movement changes this coming week. Finally, Inner Sanctum members will be able to avail themselves of an interview conducted with Michael concerning nano-silver which will be published tomorrow and early next week our take on what is happening with platinum. Meanwhile we hope and wish each of you a most pleasant weekend.